Legs on the same side of the body move forward together. Can run quickly for short bursts. Most time spent browsing, grazing, and chewing cud (partially digested food). Small groups; about 6 individuals on average (range 2-15). Grasses, leaves, and twigs of shrubs and trees. 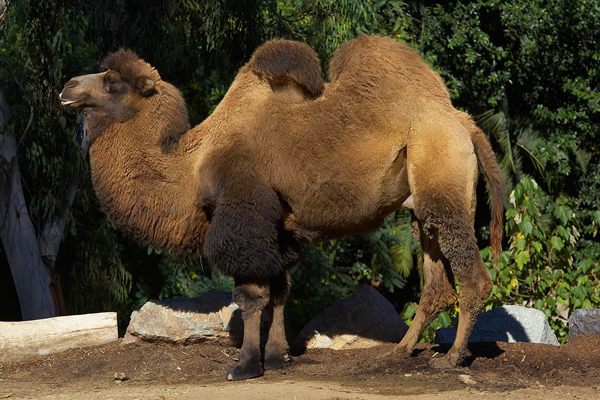 © 2009-2019 San Diego Zoo Global. Minor updates in 2013, 2017, 2019. 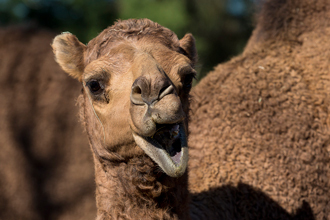 Dromedary Camels have one hump, a more smaller frame, and longer, more slender legs than Bactrian Camels. Their hair is also lighter and shorter.